Generally, humans are adversed to change. We are creatures of comfort always seeking out routines and guidelines to sort of navigate and help us get through this chaotic life. You getting your feelings hurt ( brace yourself kids the world is not fond of feelings). I laugh a lot at some of the silly things I was once was so stubborn about, because I could see now how I was just scared of change and not being in control of what those outcomes would bring. Now I embrace change, I run towards it-find ways to cope and make it work for me. If we are not changing, then we are not growing. I believe their is great value in reinvention, because you get to create the new direction of things. So be open and more importantly take some risk, Impress your damn self! Cool this style with the dotted skirt! 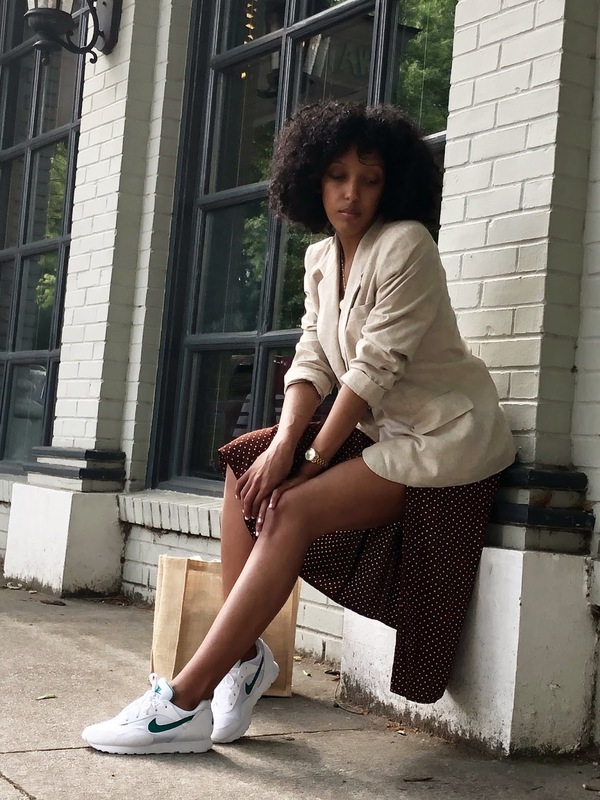 In love with this wonderful look with the dotted skirt, the blazer and the sneakers!